Let it Snow! 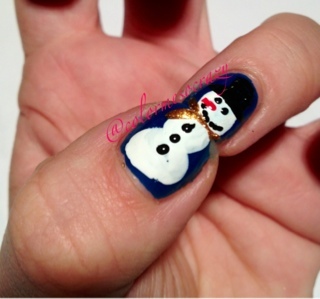 Challenge- Snowmen! How fitting since it just dumped a bunch of snow on us in Pittsburgh! Although I am not going outside to play snowman, it's just waaaay too cold for me. 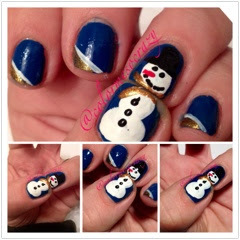 I did a similar mani earlier in this challenge and I am so glad I get to rep it again! 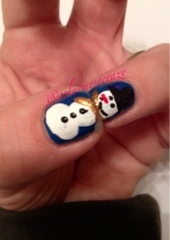 I really like my snowman and think he's sooo cute! I didn't do the whole pipe thing either this time. 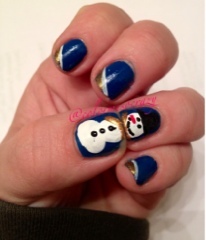 Again, my nails are too small to do all these fun things. If they were just a little wider, my art would be out of this world! I decided to use Jet Set to Paris as my background, because it is my 2nd favorite blue- behind Sation- Oceania. I was going to do a funky/trippy purple snowman, but I decided to keep it traditional. I also did some experimentation with 2 different lighting settings as well in this set.